CLOSE-UP ON BLOCK ISLAND, R.I. DISTANCE FROM BOSTON: 80 miles to state pier at Point Judith; island is 12 miles south by ferry. ODD FACTS: The island, formed by glaciers and named by Dutch explorer Adrian Block in 1614, is only 11 square miles but contains 365 spring-fed freshwater ponds. The town of New Shoreham comprises the whole island. 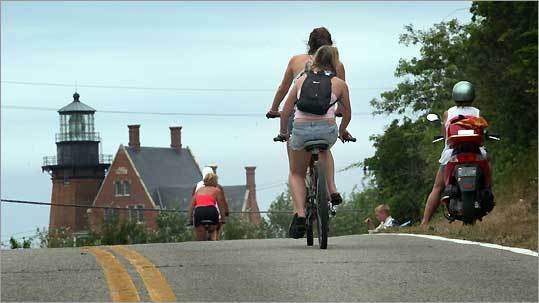 How do you get to the beach on Block Island? Walk in any direction: The entire perimeter of the 3-by-7-mile island is virtually lined with them, 17 miles worth and all free. But the island's beauty extends beyond the sand. The towering 150-foot Mohegan Bluffs in the south are reminiscent of the California coast. On the wind-whipped shores at the island's tip, North Light, a picturesque structure built in the 19th century, is being restored. This is a place where residents view themselves as stewards: 44 percent of Block Island's 7,000 acres is protected as open space. Despite all that, the Block, as it's known, is unpretentious and reasonable. A same-day round-trip ferry ride is $17.40. You'd pay more for a burger and a brew on Nantucket or Martha's Vineyard. The island is hilly but easy to get around by bike, human- or machine-powered, and Island Mopeds and Bike Rentals (Chapel Street and Weldons Way, 401-466-2700) has both, with an assortment of mopeds, mountain bikes, and beach cruisers. Plan on spending some time on foot, though, as the island has 32 miles of nature trails through such ecological gems as Nathan Mott Park (Center Road, 0.2 miles west of the entrance to the Block Island State Airport), Turnip Farm (Old Mill Road going west for 0.4 miles), and Rodman's Hollow (Black Rock Road off Cooneymus Road; about 0.25 miles down on your left is a wooden gate and turnstile marking the trail entrance). The Nature Conservancy (nature.org/rhode island) has taken a leading role in preservation efforts on the island. Local cabbies take you places only locals know on one-hour tours, including Mig's Rig (401-466-2892, migsrigtaxi.com). History buffs should visit the Block Island Historical Society (Old Town Road, 401-466-2481), which houses historical artifacts in its 1850 farmhouse. The iconic Southeast Light (Spring Street, 401-466-5009, lighthouse.cc/blockisoutheast) is one of the most photographed island sites. Block Island is one big beach, with Crescent Beach the biggest and closest to the ferry landing. It's a stretch of sand some three miles long divided into three parts, including Mansion Beach, located at the bottom of a cliff. The adventurous and reasonably fit should check out Mohegan Bluffs. A long staircase ends about 30 yards from the beach, leaving a steep traverse over hard clay and rock. The southern exposure makes this a surfer's paradise. Fishing lovers can cast from shore (Charlestown Beach's jetty is a hot spot) or boat. Block Island Fishworks (1998 Ambrose Lane, 401-466-5392, bifishworks.com) will get you where you need to go for tuna, shark, and dorado. First-run movies can be seen at Empire Theater (17 Water St., 401-466-2555). Eats with a view can be had all over the island, but you can't get any closer to the beach than Ballard's (42 Water St., 401-466 2231, ballards inn.com, entrees from $16.99 to market-price lobster). Nearby is another hot lobster spot, Finn's (Water Street, 401-466-2473, entrees $18.50-$35.50), with terrific chowder, clam boils, and deck views of people streaming off the ferry. Spectacular sunset dining can be found at The Oar (West Side Road, 401-466-8820, entrees $13.30-$28.95). Beachead (Corn Neck Road, 401-466-2249, thebeachead.com, entrees $17.95-$24.95) affords fantastic views of the ocean from its beach-facing bar and dining patio. The Block is a small island with some big accommodations, including the iconic Spring House (Spring Street, 401-466-5844, springhousehotel.com), a massive, majestic Victorian with wraparound veranda, mansard roof, and distinctive cupola set on a 15-acre promontory overlooking the ocean. Champlin's Resort and Marina (West Side Road, 401-466-5504, champlinsresort.com) is a self-contained resort popular with families, set on Great Salt Pond. Widely considered one of the most romantic lodging options on the isle is the Blue Dory Inn (Dodge Street, 401-466-5891, blockisland inns.com), a beachside inn with great views and luxury suites. Seeking a real getaway? The Barn at Schooner Point, (Southwest Point, 401-466-2310, amoreena .com/blockisland) is a beautiful barn on 10 acres of oceanfront land with views of Long Island Sound and an Audubon property. The barn's sole accommodation is a giant space on the upper floor with a king bed built up for views of ocean sunsets on one end and at the other a double bed and hayloft doors that open to reveal rolling meadows.